In part one of this article we examined how the biological sciences of the 20th century, particularly genetics and its pseudoscience cousin eugenics, affected the writing and ideas of influential horror author H.P. Lovecraft. Here, in part two, we'll consider physics, astronomy and cosmology --- sciences which explore the laws and materials that comprise both our immediate environment and the far reaches of the universe. It's gonna be a crazy ride! In Lovecraft's day, the physical sciences were causing a substantial reimagining of the quality and quantity of the universe. For the 10,000 years previous, man had employed a pretty basic rule to understand his world: what you see is what you get. The material world was made up of obvious, mostly solid components, and little thought had to be applied to understand their properties. 20th century science challenged that presumption on two fronts. For one, science began to understand that the universe was much smaller than previously understood (in the sense that physical material broke down into molecules, atoms, photons and other units which could not be seen with the naked eye) and much bigger (in the sense that the universe seemed endless.) Secondly, science was offering ever more proof that our senses, particularly our eyes, offered only a bare glimmer of reality. There were clearly many elements such as the full spectrum of light, x-rays and radiation which we could not observe unless aided with additional technologies. These observations fit in well with Lovecraft's particular brand of fiction, a sub genre of suspense which he named "cosmic horror." Cosmic horror is, as described by this Wikipedia article on Lovecraft, "the idea that life is incomprehensible to human minds and that the universe is fundamentally inimical to the interests of mankind." *Eye color is affected by several genes; speaking well requires a functioning version of the FOXP2 gene. During the same era as Muller's radioactive x-rays, the scientific theory of quantum physics was shaking foundations. Quantum physics upended several aspects of man's then understanding of the universe, not least of all Isaac Newton's classical every-action-has-a-cause physics. I'm the first to admit I understand only parts of quantum physics; one aspect of it posits that electromagnetic forces such as light behave (in some ways) the way that particles of matter behave. For our purposes here, it should be understood that quantum physics deals with the universe on a microscopic level, far removed from the ability of the human senses to directly perceive it. And, as if to further unseat our trust in our senses, in 1927, quantum physicist Werner Heisenberg offered up his "uncertainty principle" which essentially placed limits on how much an observer could possibly know about a moving particle. 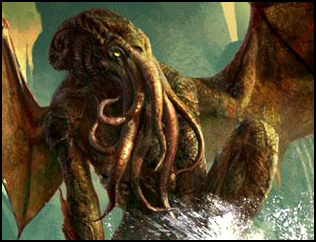 This theme, that there are limits to knowledge, was also a theme in the fiction of Lovecraft. Recall, again, the description of cosmic horror... "the idea that life is incomprehensible to human minds." Much of the discussion in the astronomical circles of Lovecraft's day had to do with the size of the universe. In 1920, a public debate on the topic took place between two astronomers. Harlow Shapley argued that the Milky Way was the entirety of our universe. Heber Curtis posited that the Milky Way was simply one of many galaxies. It was astronomer Edwin Hubble who settled the issue in 1925, making clear that there were numerous (billions) of galaxies, vastly increasing our perception of the size of the universe. And it was Hubble who also observed that the universe was expanding, a pronouncement that led to the formulation of the Big Bang theory. As man expanded his understanding of the size of the universe, the obvious question arose: were there other forms of life out there? The most famous fantasy author to explore this query was H.G. Wells with his "The War of the Worlds," but Lovecraft also made alien lifeforms a prominent part of his fiction. Lovecraft dealt not so much with individual aliens, but entire races such as the Great Race from "The Shadow Out Of Time" or the Old Ones from "At the Mountains of Madness." Without fail, Lovecraft's aliens were so superior to humans that we warranted --- at best --- only a passing glance from them, usually while they carried forth some scheme that would result in our total destruction. If a constantly expanding universe billions of galaxies wide wasn't big enough, 20th century cosmologists and philosophers also theorized the concept of "the multiverse." The multiverse embrace the possibilities of many overlapping universes that could intersect at key points. In Lovecraft's short story "From Beyond" (later expanded into a film directed by Stuart Gordon) a character opens a portal between a parallel universe which allows denizens from a foreign dimension to enter our reality. In "The Shunned House" a character comments that "scientific study and reflection had taught us that the known universe of three dimensions embraces the merest fraction of the whole cosmos of substance and energy." Clearly the ideas of the multiverse were not lost on Lovecraft. ... all my tales are based on the fundamental premise that common human laws and interests and emotions have no validity or significance in the vast cosmos-at-large. To me there is nothing but puerility in a tale in which the human form - and the local human passions and conditions and standards - are depicted as native to other worlds or other universes. To achieve the essence of real externality, whether of time or space or dimension, one must forget that such things as organic life, good and evil, love and hate, and all such local attributes of a negligible and temporary race called mankind, have any existence at all. I bet he was a lot of fun at parties. Click here for an interview with Lovecraftian filmmaker Stuart Gordon! Click here for an interview with Lovecraftian scholar ST Joshi!